Here is a great and sad story. Patricia McCormick sees a bullfight when she is seven, and 15 years later is a professional who faces hundreds of bulls over 11 years, becomes an international celebrity, then disappears for 40 years and almost becomes homeless. In the video, she says, “It has to be a passion, and you have to do what you love to do.” Below is the entire NY Times article by Bryan Mealer. My infatuation with bullfighting may have started with a Hemingway novel, but I did read other books, see fights in Spain and faced a calf in a bull ring for tourists. I was most taken with the movements of the banderilleros, who placed the barbed sticks in the bulls. Born in St. Louis in 1929, she was introduced to the sport during a vacation to Mexico City when she was 7 years old. For months afterward, she staged mock bullfights in her yard using neighborhood children as her bull substitutes. When she was 13, her family relocated to West Texas, where her father was chief engineer at Cosden Petroleum in Big Spring. After graduation, Ms. McCormick attended what was then Texas Western College in El Paso, where she studied art and music. Once there, she began crossing the border into Juárez, where she rediscovered the bulls. She watched fights at the Plaza de Toros and became a student of the form, practicing technique in her dorm room. “I had a World War I blanket my dad had given to me to keep warm, and I used that as my cape,” Ms. McCormick said in a 2007 documentary “The Texas Torera.” She left college and persuaded Alejandro del Hierro, a retired matador, to be her mentor. Ms. McCormick made her bullfighting debut on Sept. 9, 1951, in Juárez. The Big Spring Daily Herald reported that a bull trampled her twice and tossed her with its horns before she plunged the estoque between its shoulders. The crowd showered her with roses, and the judges awarded her the bull’s ear, signifying a superior performance. Over the next year, she honed her skills in the Mexican minor leagues, and in 1952 she was the first American woman to be invited to join Mexico’s matador union. For the next 10 years she fought in stadiums, drawing thousands of fans. An international celebrity, she was the subject of profiles in Time magazine, Sports Illustrated and Look. Although her fights received top billing, Ms. McCormick could never shake the title of novillera, or apprentice fighter. Elevation to the highest rank required an alternativa ceremony and sponsorship by a male matador, and no one would do such a thing for a woman. 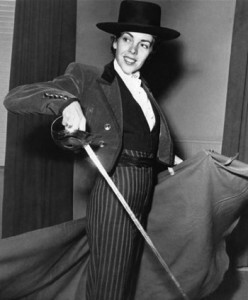 Though she faced the same dangers as her male counterparts, who marveled at the artistry of her cape work, the fact that she was a woman prevented her from achieving greater stardom in a sport dominated by men. You are currently browsing the archives for the bullfighting category.